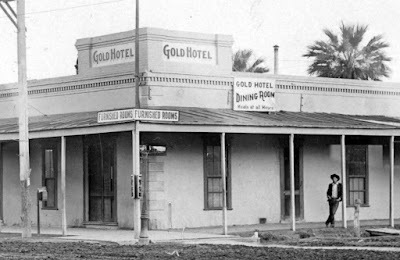 It's 1908, and I don't really have much to do today, so I think I'll hang out in front of the Gold Hotel on Washington and 3rd Street in Phoenix. Martin Gold, the owner, is a friend of mine, and he won't mind if I hang around here. I see that they serve meals at all hours, and since I have a nickel in my pocket, I'm sure that I could go in there and get something to eat. But I'm not hungry now, so I'll just lean against this railing. Washington looks pretty muddy, so if I need to walk across it, I'll use the wooden planks. These are some nice boots I'm wearing! There are also planks across the lateral, near the hitching post, which would be handy for me if I had a horse. Well, I've got the cowboy hat, and that's all I really need. Martin Gold is Yugoslavian, but his wife is Hispanic, and he spends a lot of time in the Hispanic community. I understand that he plans to buy some land just southeast of here, and will call the neighborhood "Gold Alley". That might be a good neighborhood for me to move to, once I get out of these furnished rooms. Phoenix has been thriving since the railroad got here in '87, so maybe I'll make my fortune here, start a family. 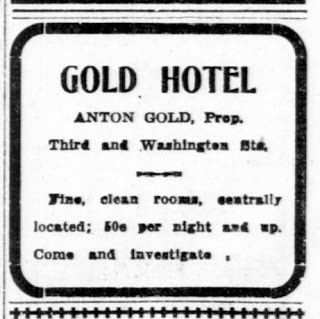 1909 ad for the Gold Hotel, 3rd Street and Washington, Phoenix, Arizona. 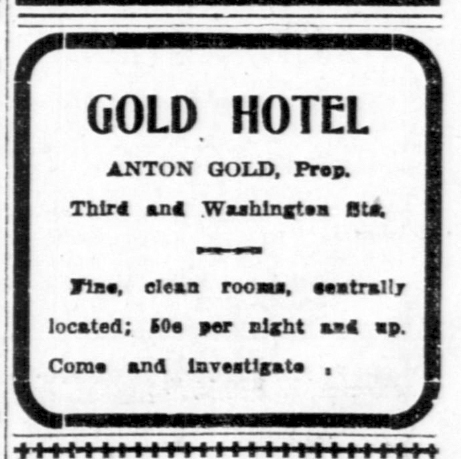 Martin Gold was kidding here about the name of the proprietor, Anton was his baby son. 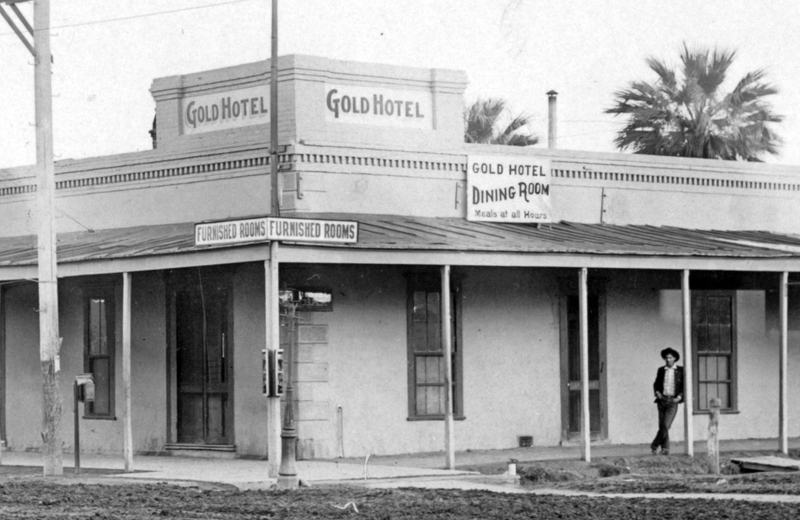 The Gold Hotel became the Ramona Theater, and is now where the Phoenix Convention Center is. And the neighborhood that came to be called "Gold Alley", between Madison and Jackson, and 5th and 7th Streets, is where Chase Field is now.